To Cite: Tabrizi A, Mehdizadeh M. Bilateral Femoral Neck Stress Fractures in a Patient with Severe Coxa Vara, Morbid Obesity and Osteomalacia: A Case Report, Shafa Ortho J. Online ahead of Print ; In Press(In Press):e84431. doi: 10.5812/soj.84431. Femoral neck stress fractures are rare and encompass 5% of all stress fractures among the young people. The bilateral cases are very rare. Coxa vara deformity and morbid obesity are some of the predisposing factors for bilateral stress fractures. The decline of neck-shaft angle will result in an increase and concentration of stress force in femoral neck giving rise to fracture. This report introduced a 35-year-old man with severe coxa vara deformity with an angle of 100 neck-shaft who had a bilateral femoral neck stress fracture and severe obesity [body mass index (BMI) > 35 kg/m2]. The femoral neck stress fracture was a tension-type occurred due to stress in coxa vara. Based on laboratory findings, his vitamin D deficiency was severe (8.9 ng/mL) but his PTH and phosphorus levels were normal. Regarding vitamin D deficiency and previous femoral deformity, the possibility of osteomalacia in adolescence period was raised. 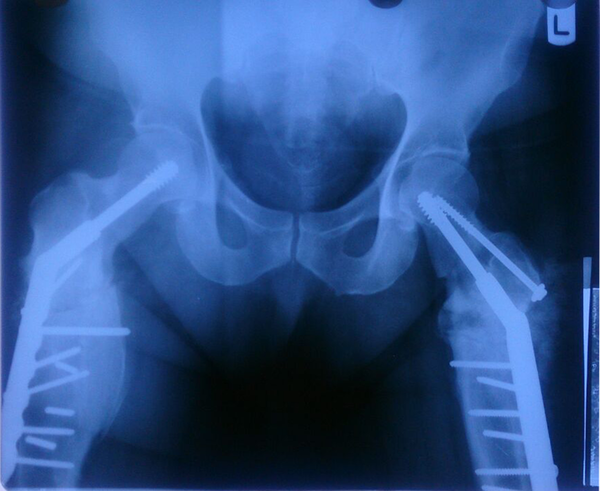 Bilateral valgus sub-trochanteric osteotomy and fixation with a dynamic hip screw (DHS) were performed. After three months, the patient restored his walking ability and weight bearing. Valgus sub-trochanteric osteotomy and fixation with DHS are useful methods in coxa vara deformity concomitant with stress fractures and can modify the neck-shaft angle. Femoral neck stress fractures are rare fractures in lower extremity; their bilateral form is very rare (1). About 5% of stress fractures have been reported in the femoral neck (2). Stress fractures in the femoral neck can be classified into two groups: insufficiency and fatigue fractures. The diagnosis of the precise pathology is a crucial step with significant influence on the treatment type. Insufficiency fractures may occur due to normal stress on the bone with decreased strength (3). Fatigue fractures, however, can be observed in normal bones of healthy people as a result of heavy exercise activities and repetitive actions (3). Osteomalacia and morbid obesity are among the common factors in relation with insufficiency fractures. In these diseases, bone metabolism is affected by vitamin D deficiency, which may lead to mineralization decrease (3). Coxa vara in hip refers to a deformity in which the neck-shaft angle is below 120. Such deformity can concentrate the forces on the hip to femoral neck. Finally, the mechanical stress in the femoral neck will cause stress fracture due to the mentioned deformity (3). In this report, we present a patient with severe coxa vara deformity who suffered from a bilateral stress fracture in the femoral neck and severe obesity with a history of osteomalacia. 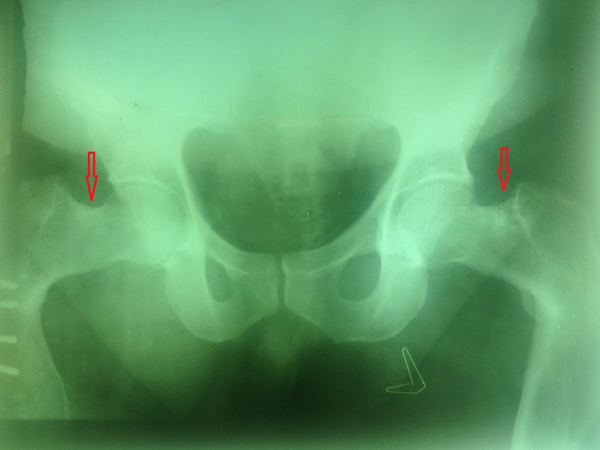 A 35-year-old man referred to the orthopedic clinic due to bilateral pain in the hip. The patient was obese with 100 kg in weight and 169 cm in height. His body mass index (BMI) was 35.4 kg/m2. He had lost the ability to walk from two weeks ago and he had been confined to a wheelchair. Based on physical examinations, the range of motion in both hips was restricted and painful. He was unable to bear weight. Anteroposterior view radiography of hip showed severe coxa vara with a neck-shaft angle of 100. Sclerotic fracture line in the superior femoral neck could be also observed in both sides (Figure 1). Fracture in the right femoral neck was not very clear; hence the specific radiography was conducted for more accurate diagnosis (Figure 2). The patient had a history of fracture in right sub trochanteric of femur 10 years before, which was treated with open reduction and internal fixation with a plate. In addition to the coxa vara, a severe deformity was observed in the sagittal and coronal plan on the right side. Broken screws in sub-trochanteric regions were also detectable (Figure 3). The patient was hospitalized in the orthopedic department. Laboratory tests were carried out to examine the metabolic reasons. Blood cell counting test was normal. The erythrocyte sedimentation rate (ESR) was measured 15 mm/hour and C-reactive protein (CRP) was qualitatively negative. Calcium, phosphorus, parathyroid hormone (PTH), and 25-hydroxyvitamin D levels were 9.8 mg/dL (normal range 8.5 - 10.2 mg/dL), 3.5 mg/dL (normal range 2.5 - 4.5 mg/dL), 179.2 pg/mL (normal range 10 - 65 pg/mL) and 8.9 ng/mL (normal range 20 - 100 ng/mL), respectively. Fasting blood sugar (FBS) and a thyroid-stimulating hormone (TSH) were normal (95 mg/dL, 2.6 mIU/L, respectively). According to consult with internal medicine department, the possibility of osteomalacia in adolescence period was raised. The patient also underwent colonoscopy, which showed non-specific colitis. Regarding the bilateral fracture and obesity of the patients, there was no definite treatment plan. The goal was the fixation of fracture simultaneous with deformity modification (neck-shaft angle). Figure 1. Preoperative AP view of both hips. A fracture line can be seen in the superior border of the left femoral neck. Sclerosis line is also observed in the superior border of the right femoral neck. Both neck-shaft angles are 1000. Figure 2. Specific AP view of the right hip. A fracture line is demonstrated in the superior border of the right femoral neck. Figure 3. Lateral view of the right hip. Severe deformity in sub-trochanteric area is observed. Furthermore, severe deformity in the sagittal and coronal plans in the right hip, as well as previous fractures, made the surgery difficult. Regarding the extent of surgery, four units of blood were reserved for the patient. Under general anesthesia, the patient underwent surgery in the supine position. First, valgus osteotomy of the left side was carried out with lateral approach and fixation was done simultaneously with a fluoroscopic guide of the femoral neck with a dynamic hip screw (DHS) 135 and anti-rotational partial thread cancellous screw. We estimated the degree of correction in AP and lateral view by guide pin under fluoroscopy. We also applied the anti-rotational partial thread cancellous screw due to more displaced femoral neck fracture in the left side, which was near to the base of the femoral neck. During the valgus osteotomy, it was possible to move rotation when the reamed the femoral neck to nail insertion. 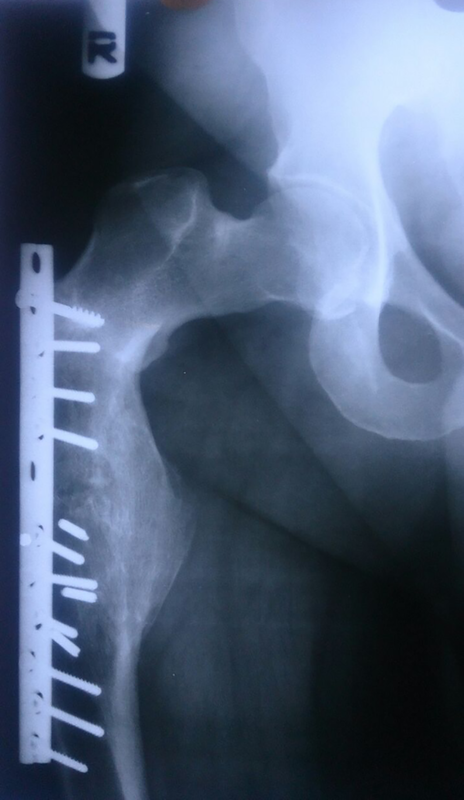 Two days later, in the same condition, the broken screw and plate were removed from the right side and modification of osteotomy was carried out in the sub-trochanteric area using a dynamic hip screw (DHS) system 135 and femoral neck fixation (Figure 4). Weight-bearing was limited for 2 months. During this period, anti-coagulant treatments, including subcutaneous enoxaparin injection (60 mg daily) along with anti-thrombosis socks were administrated for 2 weeks in order to prevent from venous thrombosis; then the patient was treated with warfarin (0.5 mg daily). International normalized ratio (INR) of the patient was maintained in the range of 2 - 2.5. The patients could walk with the help of a walker after two months with no problem in bearing weight. After starting walking and weight bearing, vitamin D deficiency treatment was begun. Fracture union occurred after six months of follow-up without any complications (Figure 5). Figure 4. Post-operative AP view of both right and left sub-trochanteric valgus osteotomy and fixation with DHS 135. Figure 5. The pelvic radiography six months after surgical treatment showed suitable union with correction of neck-shaft angle. Insufficiency fractures occur in weak and defected bones under normal daily forces. Different risk factors have been proposed for these fractures, including osteomalacia, osteoporosis, long-term corticosteroid and anticonvulsant treatment, renal osteodystrophy, amenorrhea, fluoride treatment, and pelvic irradiation (4-6). In contrary to insufficiency fractures, fatigue fractures occur in the normal bone of healthy individuals as a result of excessive and repetitive loads. It usually happens in athletes, dancers, and military personnel. It can also occur due to normal forces applied to abnormal anatomy (3, 4). In insufficiency cases, bilateral stress fractures are also probable (5, 6). Epidemiological findings indicated predisposing risk factors for stress fractures such as age, female gender, low bone density, low bone strength, low aerobic condition, low level of physical activity in the past, smoking, and excessive running (7). The study of Pouilles et al. indicated a strong correlation between low bone mineral density and stress fractures (8). The majority of bilateral cases were related to bone insufficiency more common among elderly people (9). In our presented case, there were numerous risk factors for stress fracture in the femoral neck. Severe deformity in the form of coxa vara, obesity, and osteomalacia are among the predisposing factors for stress fracture in this patient. The poor dietary habits of obese people often fail to provide sufficient oral vitamin D intake. The inverse relationship between obesity and vitamin D deficiency might be explained by deposition of vitamin D in adipose tissue leading to reduced bioavailability of vitamin D in the systemic circulation (10). Among 4 cases of bilateral fractures in non-athletes reported by Naik et al., one case had coxa vara deformity, which could be attributed to the femoral neck stress fracture (11). Sub-trochanteric valgus osteotomy managed to retrain the normal neck-shaft angle and deformity modification along with long-term bilateral fixation result in more complete patient recovery. According to this report, unlike other traumatic the femoral neck fractures, complications such as avascular necrosis or arthritis were not observed in this type of fractures (11). Oliveira et al. presented a non-athlete 43-year-old man without any history of trauma suffering from bilateral hip pain who was diagnosed with a femoral neck stress fracture. The treatments involved 7-mm cannulated screw but this patient had no deformity in femoral proximal (9). Based on the biomechanical forces, the femoral neck forces can be divided into two main groups: compression and tension types. Compression-type fractures are biomechanically stable fractures occurring in the inferomedial border of the femoral neck (3). Tension-type fractures are more common in the superior border with rapid extension, which may cause displacement. Non-surgical and conservative treatments of compression-type fractures will result in complete recovery without any complication as they are biomechanically stable (3). However, tension-type fractures require surgical interventions due to their biomechanical instability (3). Conservative treatments were impossible in our patient due to the stress fracture in superior border and severe deformity; simultaneous deformity modification was also required. Various devices have been used for treatment such as dynamic hip screw, cannulated screw, proximal femoral nail, angle or anatomic plate and arthroplasty (3). Proximal valgus osteotomy is a good approach to achieve a normal mechanical axis in the hip, which was introduced by Pauwels (12). This surgery could be also applied in the femoral neck nonunion and infantile coxa vara cases (3). Dynamic hip screw (DHS 1350) is another tool, which can be simultaneously used with deformity modification and the femoral neck fixation (11). Based on the literature review, there was a similar case reported by Sariyilmaz et al. (3). This report presented a 25-year-old woman with bilateral hip pain and bilateral coxa vara. 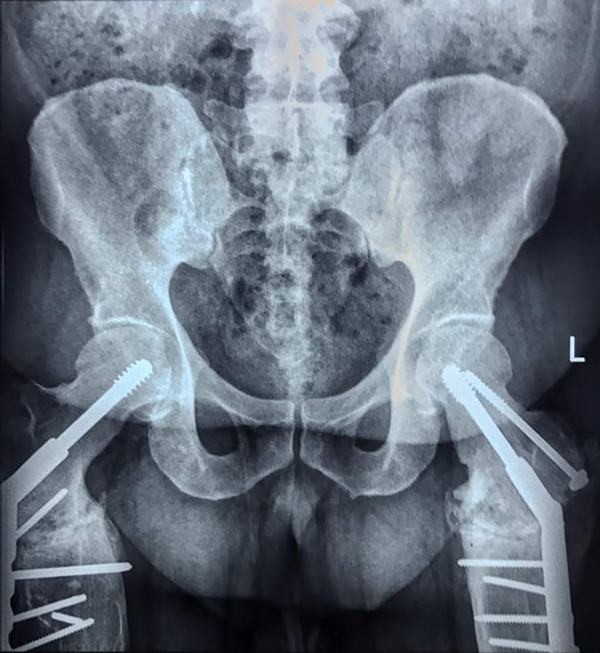 Sub-trochanteric valgus osteotomy along with 135-angled plate fixation was carried out for this patient that resulted in satisfactory outcomes. The patient could completely walk and bear the weight after 6 months (3). However, there were more problems in our patient; the presence of three-dimensional simultaneous deformity in addition to coxa vara made the corrective osteotomy a very difficult task. Moreover, problems such as displacement in the fracture site and extension of fracture may occur during surgery. Performing an accurate valgus osteotomy and preventing from breakage of the medial side and femoral calcar by osteotomy as well as manipulation may increase the chance of displacement and complications. Due to the displacement of the femoral neck fixation, we had to use a rotational screw. Anti-rotational partial thread screw was employed to increase rotational stability at the fracture site to avoid rotational displacement of the femoral neck fracture during operation and before fracture healing. We should also choose a suitable device for the femoral neck fracture fixation and simultaneous corrective osteotomy. 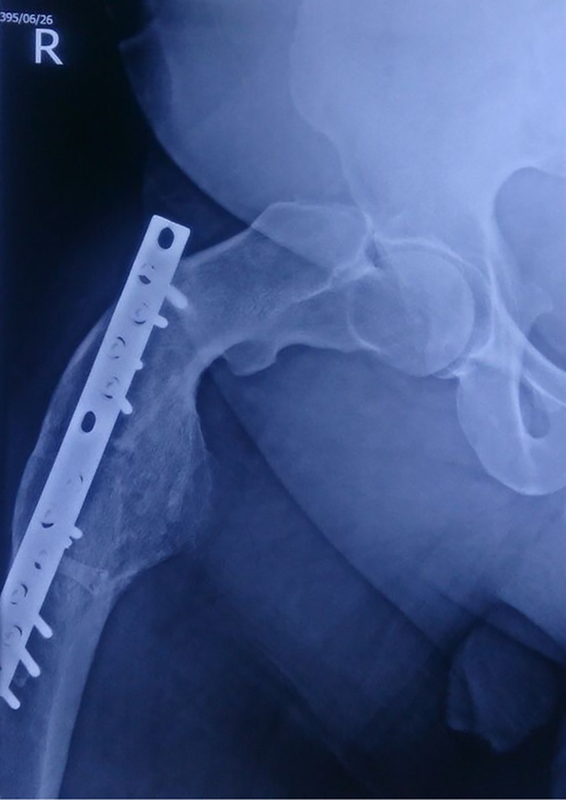 Prior to the operation, we concerned the patient’s high body mass and need to maximum instability after fixation for quick rehabilitation, thus the DHS devise was selected for the femoral neck fixation as maximum stability was achievable using this device through corrective osteotomy of neck-shaft angle and 3D deformation. Similar findings of Naik et al. indicated that application of DHS could result in early walking and weight bearing in bilateral femoral neck stress fractures. It seems that both DHS and angled plate could be useful in creating necessary stability after valgus osteotomy and the femoral neck fixation. The important point is the modification of deformity and mechanical axis to prevent from the concentration of forces on the femoral neck in coxa vara cases (11). Coxa vara and obesity are major risk factors for tension-type stress fractures in the femoral neck. Normalizing the femoral neck-shaft angle plays an important role in the management of the femoral neck stress fracture. Valgus sub-trochanteric osteotomy and fixation with DHS are useful methods in coxa vara deformity concomitant with stress fractures and can modify the neck-shaft angle. 1. Fullerton LR Jr, Snowdy HA. Femoral neck stress fractures. Am J Sports Med. 1988;16(4):365-77. doi: 10.1177/036354658801600411. [PubMed: 3189661]. 2. Lassus J, Tulikoura I, Konttinen YT, Salo J, Santavirta S. Bone stress injuries of the lower extremity: A review. Acta Orthop Scand. 2002;73(3):359-68. doi: 10.1080/000164702320155392. [PubMed: 12143987]. 3. Sariyilmaz K, Ozkunt O, Sungur M, Dikici F, Yazicioglu O. Osteomalacia and coxa vara. An unusual co-existence for femoral neck stress fracture. Int J Surg Case Rep. 2015;16:137-40. doi: 10.1016/j.ijscr.2015.09.034. [PubMed: 26454499]. [PubMed Central: PMC4643467]. 4. Markey KL. Stress fractures. Clin Sports Med. 1987;6(2):405-25. [PubMed: 3319208]. 5. Egol KA, Koval KJ, Kummer F, Frankel VH. Stress fractures of the femoral neck. Clin Orthop Relat Res. 1998;(348):72-8. doi: 10.1097/00003086-199803000-00013. [PubMed: 9553536]. 6. Rome K, Handoll HH, Ashford R. Interventions for preventing and treating stress fractures and stress reactions of bone of the lower limbs in young adults. Cochrane Database Syst Rev. 2005;(2). CD000450. doi: 10.1002/14651858.CD000450.pub2. [PubMed: 15846606]. 7. Jones BH, Thacker SB, Gilchrist J, Kimsey CD Jr, Sosin DM. Prevention of lower extremity stress fractures in athletes and soldiers: A systematic review. Epidemiol Rev. 2002;24(2):228-47. doi: 10.1093/epirev/mxf011. [PubMed: 12762095]. 8. Pouilles JM, Bernard J, Tremollieres F, Louvet JP, Ribot C. Femoral bone density in young male adults with stress fractures. Bone. 1989;10(2):105-8. doi: 10.1016/8756-3282(89)90006-9. [PubMed: 2765307]. 9. Oliveira US, Labronici PJ, Joao Neto A, Nishimi AY, Pires RE, Silva LH. Bilateral stress fracture of femoral neck in non-athlete - case report. Rev Bras Ortop. 2016;51(6):735-8. doi: 10.1016/j.rboe.2016.10.013. [PubMed: 28050549]. [PubMed Central: PMC5198079]. 10. Dastidar R, Halder T. Vitamin D Deficiency in non-skeletal disease: More than just a coexistence? Eur J Pharm Med Res. 2017;4(2):553-61. 11. Naik MA, Sujir P, Tripathy SK, Vijayan S, Hameed S, Rao SK. Bilateral stress fractures of femoral neck in non-athletes: A report of four cases. Chin J Traumatol. 2013;16(2):113-7. [PubMed: 23540902]. 12. Pauwels F. [Biomechanics of bone grafts]. Acta Orthop Belg. 1971;37(6):701-25. French. [PubMed: 4948622].